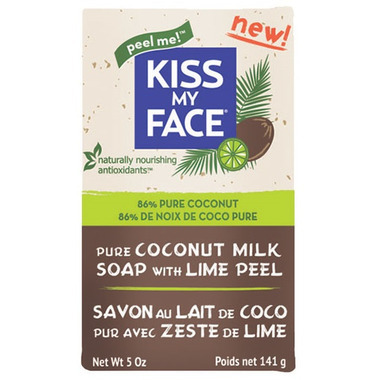 Kiss My Face Pure Coconut Milk Bar Soap for 100% Super Moisturized Skin! One Kiss is all it takes™ to cleanse and hydrate your skin with 86% Pure Coconut. Pamper your skin with Naturally Nourishing Antioxidants™ such as Coconut Milk and Coconut Oil that helps provide deep moisture for radiant skin. Take a sweet escape in the shower with invigorating coconut-citrus fragrance. So go ahead, go nuts™! Ce savon est sublime! Sa mousse est riche et abondante, il exfolie en douceur et que dire de la douce odeur de lime! Merveilleux! Smells nice, but leaves a bit of a film on my skin. Really nice lather and scent, washes off clean too! Lathers nicely and smells alright, but it makes my hands super dry.. don't really know why ! Great soap bar. Refreshing scent, great later and rinses clean. We love this soap! Great refreshing scent, and it lathers very well. Great soap! Smells good and lathers pretty well. This soft is awesome! Nice fragrance and it lathers up really well.